In today’s fast-paced world, making time for dental appointments is often the last thing on an individual’s to-do list. Receiving adequate dental care, however, is essential to promoting good oral and general health. We understand how busy patients are and seek to make treatment safe, effective, and convenient, regardless of the patient’s dental needs. Using the latest technology, including the CEREC® milling machine, we are able to promptly treat oral health conditions, providing pain relief and natural aesthetic results in as little as one dental appointment. If your teeth have suffered damage and you are in need of a restoration, we want you to understand that the process doesn’t have to be time consuming or expensive. With CEREC®, we can provide you the relief and natural-looking results you need in just one office visit. Contact us today to schedule an appointment. CEREC® is a revolutionary dental technology that allows us to create custom porcelain restorations, such as crowns, veneers, and white fillings in as little as one hour. 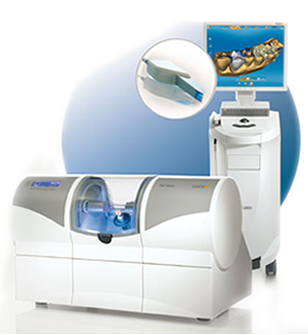 Instead of making dental impressions using pastes and clays, which can prove to be messy and inefficient, CEREC® technology uses computer imaging to get a precise view of the structures of the mouth. These images enable the creation of strong, well-fitting porcelain restorations by the CEREC® milling machine. In the past, dentists had to send dental impressions to a lab and fit patients with a temporary restoration while the final product was being made – a process that could take weeks. By utilizing CEREC® technology we are able to provide near immediate results for patients, increasing their comfort and providing invaluable convenience. CEREC® is the safest and most effective way to repair damaged teeth and create a beautiful, healthy smile. In addition, CEREC® makes receiving high-quality restorations a comfortable, quick process. During a dental appointment, the tooth is prepped for treatment by removing any bacteria or decayed material. In the case of porcelain veneers, he will gently remove the top layer of enamel to make room for the veneers. Then the dentist applies a powder to the area being treated and takes a digital image of the mouth. This image is viewed using CEREC® technology software, giving a complete view of all structures of the mouth, not just the affected area. This is essential to ensuring that the treatment will be long-lasting and comfortable. Using our expert knowledge and keen aesthetic eye, we enter the specifications for the custom restoration, based on the digital image. Once this is complete, the porcelain crown, veneer, or filling is created in-office in less than one hour, and is ready to be placed for permanent use.